La Vie Vu Linh is a community tourism development project with a strong focus on responsible and sustainable investment activities through Education, Environment and local Culture preservation. The long term goal is to bring about a better life to the Dao Minority people living in the region and more widely to contribute to the Yen Bai Province economic development. La Vie Vu Linh is happy to announce the arrival of a couple of young French VSI (Volunteers for International Solidarity), who will stay for an initial period of 1 year starting from March 2019. Fanny and Sébastien will help in the Eco-Lodge General Site Management as well as the Maintenance and further Development of the socio-ecological associated projects. LaVieVuLinh has just implemented a “low season” operating mode as from December 2018 until further announcement from the Management. Consequently the Lodge will only receive and serve clients having made advanced bookings for accommodation as well as for meals. The Lodge reception will be closed when no bookings have been made. 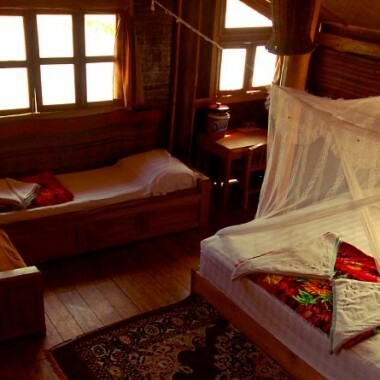 The eco-lodge built according to local traditional technics is nested amongst the other houses of the Dao minority Ngoi Tu village and is closely connected to the local cultural and social life. The lodge staff are mainly recruited from the nearby villages and tourism activities developed are all carried out with the participation of the local Dao Community providing them with the opportunity to improve their living conditions. All our rooms are built using local knowledge and materials to ensure you a beautiful stay. 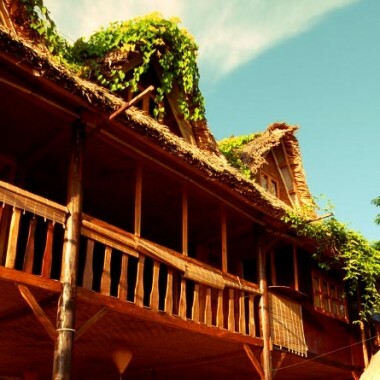 Let yourself soak up the subtle and complex Dao culture while staying in this beautiful precious-wood house. The rammed earth rooms, built according to African and Vietnamese traditional techniques, provide a good thermal comfort, cool in summer, warm in winter. Stay in one of our 2 duplex studios with stunning view on the lake. Beautiful double and triple rooms with terrace and direct view on the lake. Stay in one of our four double rooms offering the most beautiful view on the lake. Budget travellers can experience the Dao culture by staying in our newly-built dormitories. Our menu offers a special “Fusion Cuisine” composed of varied and tasty food, coming from the encounter between the Dzao Cuisine and dishes from all over the world. All the products used in our kitchen are fresh and natural, brought every two days from a local market. We offer a large range of activities for those who are willing to have an immersive experience in Dao culture. Going Local in Vietnam’s Villages , by Mike Ives. La Vie Vu Linh is a sustainable tourism development project aimed at contributing on the long term to bringing about a better life to the Dzao Minority people living in the region. Our Address: Ngoi Tu village, Vu Linh commune, Yen Binh district, Yen Bai province, Viet Nam.